I'm not sure where to begin with this one. 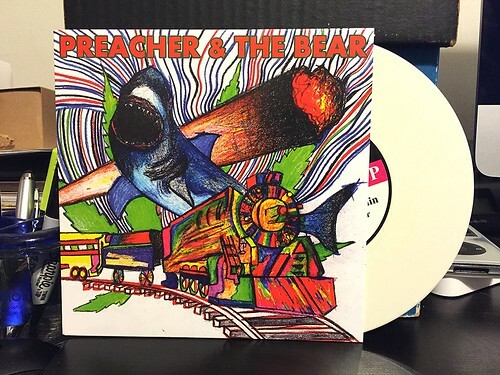 Preacher And The Bear's 7" was sent to me all the way from the UK to review, so I'm sure it cost a little bit to send it to me. I'm appreciative that they took the effort, but man, I don't like this. It's somewhat sloppy, questionably recorded "blues" music. They kind of sound like a bunch of drunk old guys who got together at a bar to play a song, only for some reason the singer is trapped in some sort of metal box that he's shouting in. The band yells over and over again on this 7" that they "can't afford no train." It doesn't sound like they can afford no microphones either. I think the band is aiming to be the sort of cool, throwback blues band like Ballantynes. The problem is that the Ballantynes write awesome songs, play them flawlessly and record them nicely. I can't say that Preacher & The Bear do any of that.